Can The Saints Give You Support? I recently came across a book review of Saints to Lean On and wanted to interview the author, Sister Janice McCrane. Sister McGrane was diagnosed at age 25 with rheumatoid arthritis (RA), a form of arthritis which is painful and which also creates deformities in the joints. She shares some of her wisdom below. How to Cope with Pain: Can you tell us a little about yourself? Sister McGrane: I was diagnosed with rheumatoid arthritis at age 25, and unfortunately it’s severe. I have so many joint replacements and fusions that my friends refer to me as the Bionic Nun. I entered the Sisters of Saint Joseph in 1983, and my primary ministry has been with disabled persons. Presently I’m chair of the board at Liberty Resources, the disability advocacy organization for Southeastern Pennsylvania. And I’ve just begun working on a sequel to Saints to Lean On, which is selling quite well. HtCwP: Can you tell us a bit about your own experiences with pain? SM: Yes, I’ve had times of significant pain, mainly because RA wears away the cartilage in joints, resulting in bone rubbing against bone. Before I had the major joint replacements, I remember contemplating, Should I keep standing in pain, or sit down and have the pain of getting up again? A few months ago I fell, resulting in a severe hip contusion (thankfully, not a break). It was so painful I had to use a wheelchair for three weeks. I’m fortunate, however, that since the major joint replacements, pain does not rule my life. 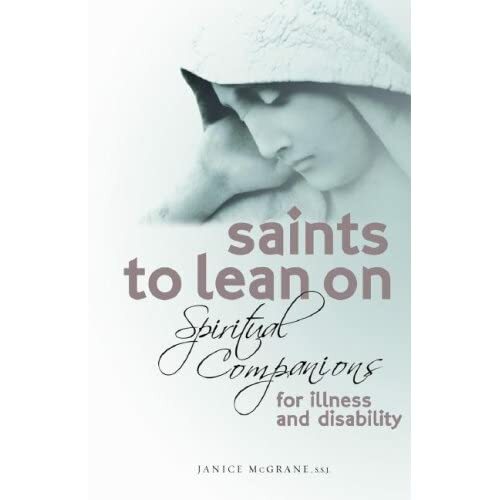 HtCwP: Your first book is Saints to Lean On: Spiritual Companions for Illness and Disability. Can you tell us what the book is about, and what your inspiration for writing it was? SM: From my own experience, and ministering with people with disabilities and illnesses of all kinds, I recognized a need for us (actually, all people) to turn to someone among the Communion of Saints who has experienced illness, disability, or pain. I hope to encourage people to recognize that, along with their genuine holiness, saints also lived with physical and mental ills. I attempted to invite people to turn to someone among the Saints to whom they feel drawn. I relied on Sister Elizabeth Johnson’s scholarship in Friends of God & Prophets, which reclaims the early church model of saints as companions, as well as intercessors and role models. HtCwP: Can you give us an example of one of the saints whom you write about? SM: Probably the best example of someone with excruciating pain is Therese of Lisieux, the Little Flower. She was in agony as her lungs deteriorated from tuberculosis. In addition, her superior denied her any relief from morphine, deeming it not appropriate for a nun. The treatments were ineffective and awful, for example, puncturing her chest with burning needles. Therese was honest about the fact that she was in great pain. Her death is quite well documented. HtCwP: Illness, pain, and other challenges can sometimes test our relationship with God. Did you ever experience that? SM: Definitely. For years I struggled with, Why me? Of course I’ve been angry with God, too. As my level of disability is quite visible, I also go through periods of struggling with how I walk, people gawking at my hands, etc. HtCwP: On the other hand, great wisdom and growth can come out of adversity. Do you believe there were silver linings for you in your experience of illness, related to your spirituality or otherwise? SM: I don’t just believe, I KNOW that human struggles of whatever nature have the potential to bring us closer to God, assuming we’re open to the grace. In my case, I have united my pain with Jesus time and time again. I believe as Caryll Houselander articulated so well in her work, that suffering is redemptive, that it heals the Body of Christ, in whatever mysterious way that occurs. As for silver linings, I stopped driving years ago, which is difficult. However, several of my friendships have deepened through many a car talk that would never have happened if I were still driving myself. I’m convinced God will bring good out of even the worst situations. Thanks so much to Sister Janice McGrane for sharing some of her story.